Recently we had a customer call us with a common problem. She had been hearing a high pitched squeaking noise coming from above her bedroom ceiling and now has a bat flying around her kitchen. It was around 10 pm when Wildlife Command Center received the call and began to walk her through what she needed to do. 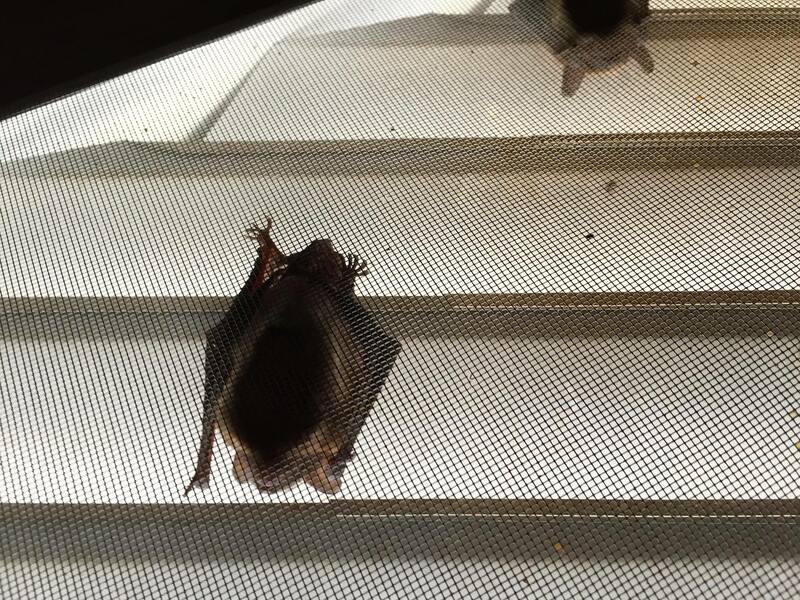 Kansas City Bat Removal KC Missouri We explained to minimize the areas and rooms the bat could access by closing any doors she could, covering the bottoms with a towel or blanket and to keep an eye on the bat until one of our trained technicians could arrive. Bats do not try to fly towards humans and are actually very skilled at avoiding us while flying around through their use of echo location. We assured her that it was safe to stand off to the side and observe the bat as we sent our team to rescue her from the situation. Upon arrival the customer explained that she did her best to close any doors but had lost sight of the bat while doing so. Our team starts by carefully checking the most common places bats hide while stuck inside the living space of a home. The technicians at Wildlife Command Center are trained in bat behavior, the proper handling and removal of bats. After a very thorough search, we were able to find the bat had landed behind a pillow and crawled its way down into the living room couch. The bat was removed safely and unharmed. Wildlife Command Center presented her with a detailed action plan to completely seal the entry points of the home, exclude the colony of bats and clean up the guano. To properly exclude the bats from the home and ensure they would not return, every bat accessible entry point was sealed off. Over the main entry point a bat exclusion device was installed to allow the bats to leave, but upon return would no longer have entry to the home. After we established the colony had left, our team removed the guano, contaminated insulation and sanitized the attic. Now the bats are gone, the home is bat proof and it’s like the colony of bats were never there. Understanding Nuisance Wildlife and how nuisance animals affect people, resolving human vs wildlife conflicts with win/win results Specialties: Falconry and avian control are my specialty Falconry-based bird abatement for agriculture, landfills, resorts and other situations with pest bird problems. Falcons can chase gulls off landfills, coastal resorts and golf courses, more efficiently and quieter than other methods. Providing traditional falconry methods to control nuisance birds at vineyards, crop fields, airports, and landfills. "Falconry based bird abatement" is the use of trained falcons and hawks to intimidate and scare off nuisance birds which cause loss of revenue for crop growers, health hazards in landfills, and safety concerns in airfields.